AFBI along with partners in Cefas, in the England and Wales, and the Marine Institute, in the Republic of Ireland, have begun a 3 year programme of tagging cod in the Irish Sea, funded through the European Commission. 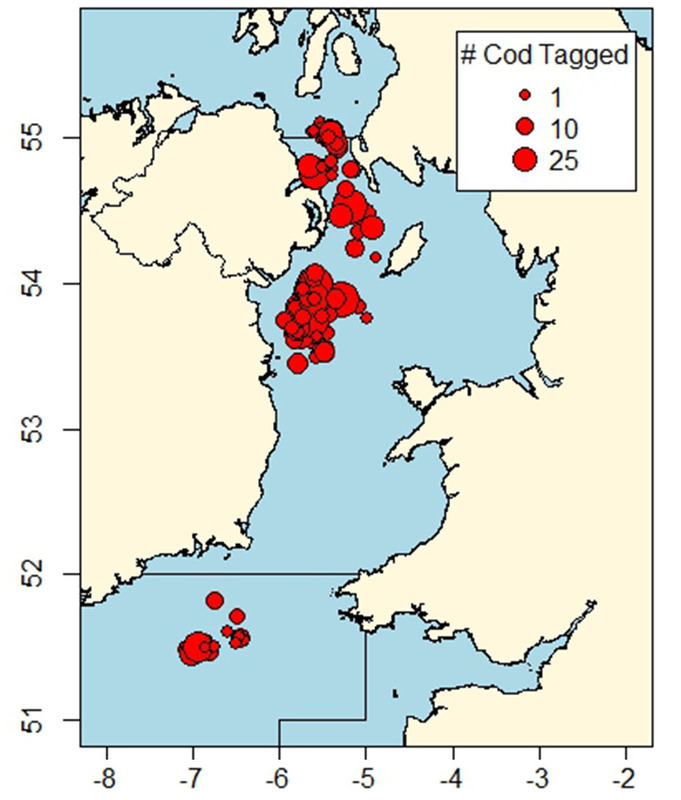 Of primary interest to the project is to better understand cod mortality, abundance, distribution and movement patterns within the Irish Sea and neighbouring areas. By addressing these issues it is hoped that differences of opinion between the industry’s perception of cod abundance and the scientific assessment of the stock can be realigned to provide a consensus opinion supported by all. The Irish Sea cod stock has historically been important for commercial fishing fleets principally from the UK and Ireland. However, catches and spawning stock biomass have substantially declined in the last decades. Significant effort has been made to recover stocks of Irish Sea cod including the introduction of highly selective gears to reduce bycatch rates, management of fishing effort directed on cod and seasonal area closures to protect spawning aggregations. Although an ICES long-term management plan has been in place, the Irish Sea cod stock has not responded as expected meaning that there still remains a need to better understand the factors that have an effect on the size and status of the stock. Further information on the Irish Sea cod stock is available from the following link: http://www.ices.dk/sites/pub/Publication%20Reports/Advice/2017/2017/cod.27.7a.pdf and this project will make a significant contribution to this advice. 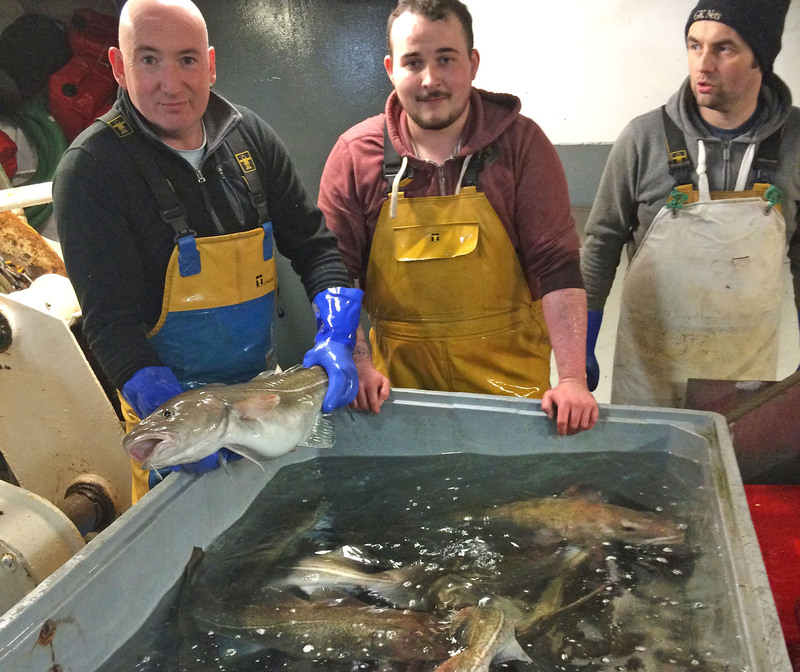 The project relies on collaboration with the fishing industry to provide the data to develop a better understanding of the current behaviour, biology and stock status of Irish Sea cod. Any recaptured tagged cod can provide useful information. Building on existing science and industry partnerships is essential if we wish to achieve a sustainable and profitable fishing industry in the Irish Sea. If a tagged cod is recaptured the tag itself has a telephone number that can be used to report the required information. A reward (€25 for a red tag, €75 for a pink/blue/yellow tag, plus an additional €1000 for every 20th tagged cod returned) can be claimed for any cod recaptured when reported along with the supporting information below. The cod should be stored ungutted with the tag in place, on ice, and we will organise collection. All this additional information allows us to build a picture of the cod stock in the Irish Sea.